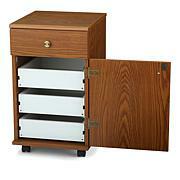 Easily sew or stow with the Arrow Airlift Sewing Cabinet with Built-In Storage. 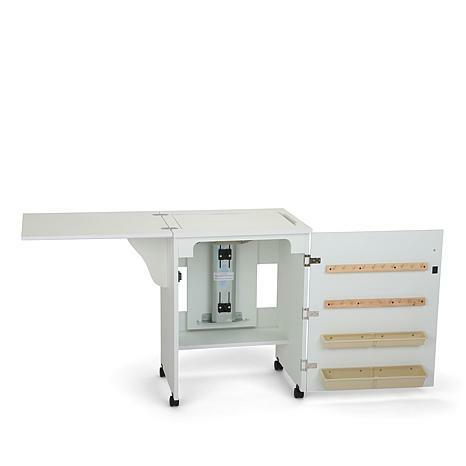 This cabinet features an EZ-lift air mechanism that moves your sewing machine up and down like an elevator into 3 positions: free arm, flatbed and storage. 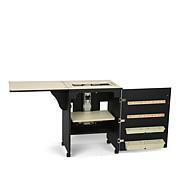 With casters for portability, a fold-out leaf for additional workspace and built-in storage in the shutter door, this cabinet is ready for work and ready to make it easier. The following Singer machines DO NOT fit in this cabinet: Futura Quartet, Quartet 4, XL-400, SEQS-6000, Quintet, SEQS-6000 and SEQS-6700. I recently graduated from graduate school and sewing cabinet was my present to myself. Before purchasing, I kept my sewing machine on top of a desk, and this sewing cabinet has been wonderful. It took my Dad and I about 3 hours to put it together, but it wasn't difficult. Also, the Airlift feature is super easy to use! I would definitely purchase this product again! I’m really glad that I got this. I recently purchase an Industry type of sewing machine JUKI TL98Q which was portable & it’s pretty heavy machine. 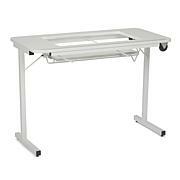 I purchase this & it fits perfectly with my sewing machine! I also have a Singer serger & a Brother sewing Machine & all fit perfectly. Setting it up was not that bad, it took me about an hour by myself. The directions may not be clear & understanding for those who are not good on building things but it wasn’t a big deal. The instructions say you need two people to place in the lift table; I was able to do it on my own, without any trouble. OVERALL GREAT TABLE. I really love my Arrow Sewing Cabinet. It allows me to airlift my sewing machine without doing that heavy lifting. However, for the price, it should have come already assembled it took a little over two hours to assemble, but I did take a break or two. It would have been easier had I used a power screwdriver. An Arrow representative contacted me to inform me that it was on the way and to use shorter screws for one portion of the cabinet. The video on their web site helped tremendously!!! Cabinet arrived very quickly & well packaged. All directions for assembly were very easy to follow with the exception of the airlift portion which seemed a little confusing. For the most part I was able to assemble it on my own with the exception of the airlift mechanism. 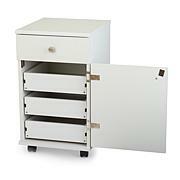 The cabinet is sturdy/solid, attractive, and the perfect size for small spaces. It doubles as a night stand in the guest bedroom. I am very pleased it. The cabinet is very attractive and compact however I think it should be made out of real wood because the composit is too heavy to move around.